Fabric expansion joints can be shipped in a variety of conditions to allow for the most economical installation. In certain instances, it is practical to ship joints fully assembled ready to drop into place. In other cases where access is limited or joint size exceeds normal shipping constraints, the joint can be broken down into small segments and then assembled in place at the job site. 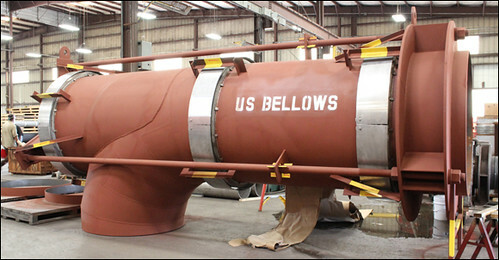 U.S. Bellows will provide the appropriate detailed storage, handling, and installation instruction based on how the expansion joint is shipped.Please use these instructions for assembled fabric expansion joints in conjunction with the approved drawing provided by U.S. Bellows. Confirm dimensional data per U.S. Bellows’ approved drawing. Confirm duct/duct flanges are in good condition. Prior to installing the expansion joint frames, the opening into which the expansion joint will be installed must be inspected to verify that the opening is in accordance with design tolerances. The expansion joint is not designed to accommodate installation misalignment, unless clearly specified as a design requirement. 1. Compare the maximum continuous operating temperature of the application against the fabric temperature rating. 2. If the application has high fly ash or dust loading, select a material with high tensile strength. 3. If the application is near a fan or where flow turbulence is expected, select a material with high flutter resistance. 4. Elastomers vary in their chemical resistance. The selected Elastomer should be checked to insure that it is compatible with the particular media it will encounter. * Not suitable for sustained service where oils, hydrocarbons or concentrated minerals acids are present. Congratulations on Winning the EJMA Standards 8th Edition Book! We had a great turnout for our U.S. Bellows Expansion Joint In-Depth Webinar on November 8th. We are proud to announce the winner of our drawing for the EJMA Standards Eight edition Book is Jeffrey!